BERE islanders are working to source housing to encourage people, especially families, move there and help keep numbers up at their school, which is now the only school left on an island in Bantry Bay. Principal of Scoil Mhicil Naofa Deirdre Ní Dhonnchada explains how, as with all small rural schools, maintaining numbers is a constant issue. ‘This year five pupils will be leaving to start secondary school in Castletownbere and we have only three children due to start school. We currently don’t have anyone in second class, as there was no intake that year,’ she said. However, the community is actively working to encourage people to relocate there. West Cork’s islands are taking a population battering, with Sherkin Island’s school closing, after 124 years’ service to the community, in 2016. Securing housing for new families has regularly been quoted as a reason why the islands are not sustaining their former populations. The two-teacher island school currently has just 18 pupils. Principal Ní Dhonnchada and Katrina Ladden both live on the mainland and travel onto the island every day by ferry. Support teacher Caoimhe Healy joins them two days a week. Katrina teaches junior infants to second class, and Deirdre teaches third to sixth classes, with school secretary Marion O’Sullivan keeping everything running smoothly. Scoil Mhicil Naofa is now the only school on Bere Island, which in the early 1900s, once had a total of three schools. Ballinakilla National School catered for children in the western end of the island and Lawrence Cove National School was located in the eastern end of the island, along with a military school for the children of British servicemen stationed in Fort Berehaven. Neighbouring islands in Bantry Bay, Whiddy and Dursey also had their own schools. The school on Whiddy Island closed in 1947 with seven children on the roll, and the Dursey Island school was forced to close in 1975 when there were just five pupils left. The original Ballinakilla National School was badly damaged in a fire in 1978. 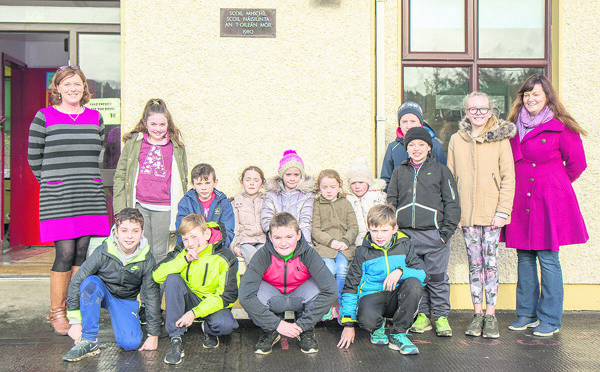 The school moved to a temporary premises in the island presbytery until a new purpose-built school, Scoil Mhicil Naofa, opened its doors in 1980. On the day The Southern Star visited the school, it was a hive of activity. The pupils and their teachers were in the midst of final preparations for a visit to the Primary Science Fair in Limerick, where they were to showcase a project they had put together. Children’s author Anthony Garvey was visiting the school to give a talk to the senior class, and the younger pupils were keen to show their innovative “buddy bench” in the playground. ‘If a child is feeling lonely, or just not up to playing on a particular day, they can sit on the bench and it’s a sign for other children to join them and keep them company,’ explained junior room teacher Katrina Ladden. Physical activity is a big part the curriculum.